Money in the Garage: Trash picking for fun and profit. Not all your inventory has to come from daily trips to the thrift store and yard sales. I have found numerous items to sell sitting right out at the curb, left for trash. Don't knock it, once I even found a fresh cut Christmas tree with a "free" sign on it. No, I didn't sell it on Ebay, I am not that wackie! The curb side find became our second tree and was displayed in our family room. We always like to put up a smaller tree in the family room, and I figured my find saved me about $35 that year! But the mother of all freebies for me started one glorious day when I pulled into in my driveway. I looked over to my neighbor's house and my heart rate began to race; there sitting at the curb was a gleaming GE electric oven. I laughed in disbelief...I had some history with this behemoth. The previous owner of this oven had once asked me to help her poor husband schlep it down to her basement. My "Yuppie" neighbor had tricked out her kitchen with new marble and designer appliances. She then had a grand scheme to use the old oven strictly for occasional holiday cooking. But unfortunately for my old neighbor, her corporate job was eliminated and she moved away leaving the "back-up" oven to languish in the basement for the new owner to contend with. Lucky for me, my brother-in-law was with me when I eyeballed this beauty from across the front yard...a curbside gift from my new neighbor! We quickly went into full alert, hoisting the sparkly clean oven onto my hand truck and wheeled it into my garage. I shut my garage door quickly, not wanting my new neighbor to see I was about to turn a quick profit on his cast-offs. The oven was a perfect candidate for Craigslist. 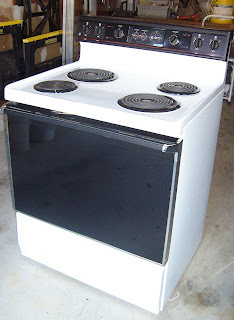 Since I knew the history of the oven I described how “Mrs. Clean” had owned it and that it was in "like-new" condition. I sold it quickly, thanks to my description and multiple pictures. This curbside moneymaker earned me a fast $125... and it was just sitting out for trash no less! As I was counting my money, I gleefully remembered how I cursed the thing when I carried it down my neighbor's basement. Thanks old neighbor, wherever you are!